I’m excited to be hosting the #PacketsUp Twitter Party on October 25th and I hope you’ll join us! This Thursday I will be joined by Mariah at The Simple Parent for a fun Twitter party where we will be talking about laundry room tips, precious parenting moments, and how we can all save a little money! We’ll also be giving away a PRIZE, so make sure to register early! That’s why the American Cleaning Institute’s Packets UP! campaign grabbed my attention. Packets UP! is a child safety initiative for parents and caregivers with a simple message – practice proper and safe storage by putting laundry Packets UP and out of sight from children. 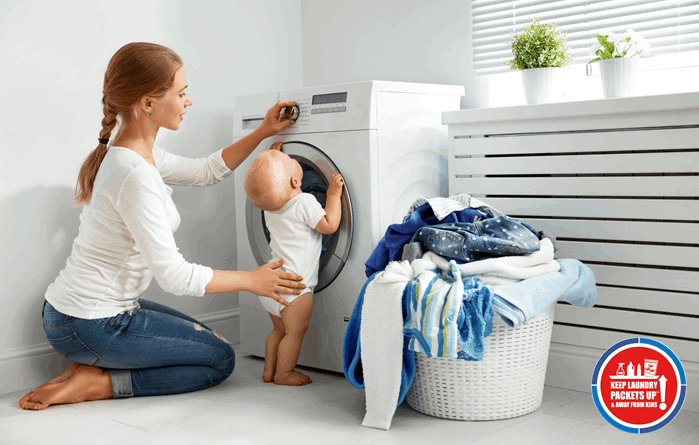 Liquid laundry packets contain a pre-measured amount of detergent that makes laundry day a little easier for busy parents. But as we all know, kids act fast, so it is important to be diligent about safe storage to prevent accidents from happening. We will be talking about laundry room tips, child safety, and more at the #PacketsUp Twitter party on October 25th. Check out all the details below and make plans now to join us! Awesome, gotta day laundry is my favorite chore lol @danitapia88: :RSVP!